This waterfront Picnic Bay holiday home has everything you could need for the perfect family holiday. Situated on the waters edge it comes complete with a boat mooring and pontoon and it's only a few steps across the lawn to a picturesque all tide swimming beach. The lawn leads onto a large reserve, meaning a fabulous outlook, but also there is plenty of room for a game of cricket, or the kids to explore safely within shouting distance of the house. The house is beautifully presented with multiple living areas, seamless indoor/outdoor flow and plenty of space for all the family. The well equipped kitchen serves several dining spaces including the designer kitchen booth and large indoor and outdoor dining areas. Upstairs is a second living area and three large bedrooms with two bathrooms. A second wing within the house has two further bedrooms with bathroom. 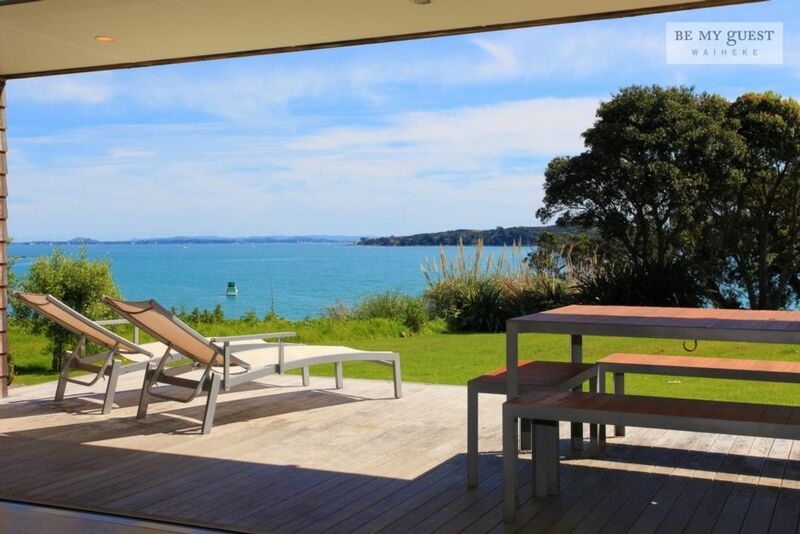 This Picnic Bay luxury accommodation is the perfect Waiheke holiday destination. Picnic Bay is located a minute away from the Kennedy Point car ferry terminal, and minutes from Oneroa Village and the Matiatia passenger ferry. There is a great winery just down the road, and many more wineries and great beaches within 10 minutes drive. Each stay incurs a $250 charge for quality linen, towels and exit clean so you have nothing to do but relax, refresh and enjoy. The property is not to be used for any parties or gatherings. Families and small groups preferred. This stunning waterfront luxury home is the perfect family holiday spot. Situated on the waters edge it comes complete with a boat mooring and pontoon and it's only a few steps across the lawn to a picturesque all tide swimming beach. The lawn leads onto a large reserve, meaning a fabulous outlook, but also there is plenty of room for a game of cricket, or the kids to explore safely within shouting distance of the house. Perfect family holiday spot, a beach on your doorstep, large lawn, lots of room and close to everything! This spot is too nice. We had a great time, it is hard not to. This side of waiheke is quieter and we liked that. The home is beautiful and was more than we needed. Thanks for sorting out the water issue soo quickly. Thanks for your review. We are so glad you enjoyed your stay in that special spot! See you next time! Such a fantastic house, close to the car ferry, and only a short drive to town. Beautiful house, fantastic layout! Plenty of sleeping spaces, with the most incredible view. Was a great weekend away, and nothing was too hard. We are so pleased that you enjoyed your stay! Picnic Bay is a hidden gem, and such a great house! Please do come back again. Amazing place with an amazing setting. So glad you enjoyed your time in that great spot. How were the sunsets?! We look forward to hosting you again. Fantastic views and a warm sunny position. Fantastic views and a warm sunny position. Plenty of room for everyone in our 3 sets of guests. Stunning property and view. Easily slept 8 of us, and has everything you need. We're already thinking about our next weekend here! Picnic Bay is a lovely residential seaside area, quiet and friendly. It is a minute away from the Kennedy Point car ferry, and a few minutes drive to Oneroa Village and the Matiatia passenger ferry. There is a winery just down the road, and more wineries & fabulous beaches within 10 minutes drive. Oneroa Village is a few minutes drive away, as is the golf course.